Police applied force to the participants of a rally in support of the detained Ukrainian sailors. The rally was held near the Russian Consulate General, as Dumskaya reported. The protesters wanted to put red paint on the fence and gates of the establishment. The red paint symbolizes blood. Yet, the law enforcers did not let the protesters do that. 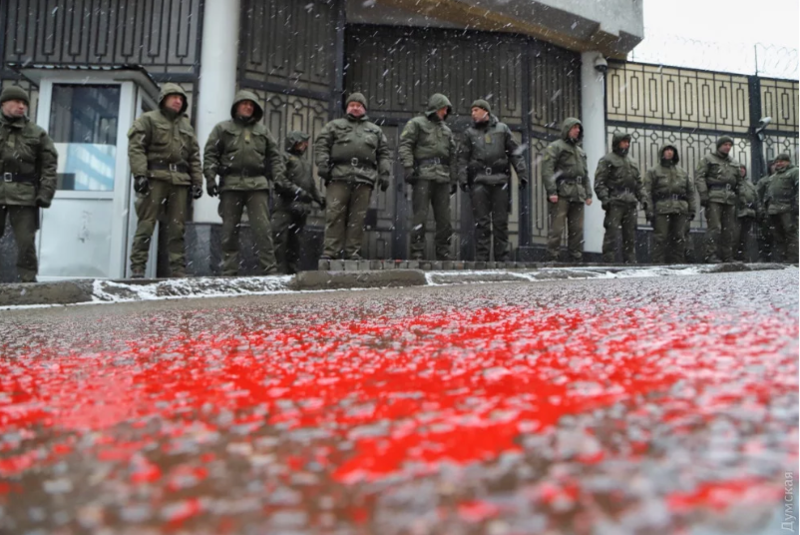 As a result, the paint appeared on the road and on the participants of the rally. Two people were arrested, including Todor Panovsky, a former member of “Samooborona” organization. One of the organizers of the protest Vitaly Kozhukhar said that police’s reaction surprised him. “The event had to be peaceful, this paint can be easily washed off. I don’t understand why did they applied force,” he said. 50 people from different patriotic organizations and several dozens of police officers took part in the rally.